First DVD of the Brazilian Guitar Quartet Quaternaglia includes images of the release of the CD Presença, statements and making of. 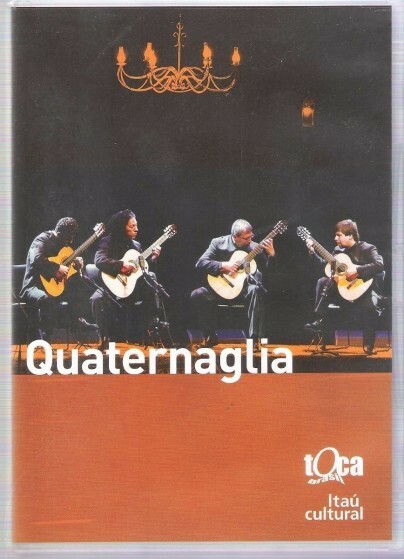 The second volume of “Toca Brasil DVD Series”, which documents the work of ten artists that performed at Itaú Cultural Hall in 2004, is dedicated to Quaternaglia Guitar Quartet. The video shows the complete release recital of the album Presença – performed in November – as well as statements from the members of the ensemble and other musicians, such as Egberto Gismonti and Paulo Bellinati. The release of the DVD, distributed commercially by Eldorado Label, occurred on March 30th, 2006 at Sesc Ipiranga Hall. “Joining four guitars is almost an utopia”. That is how Egberto Gismonti defines the challenge faced by the group in the interview that opens the extras of the DVD, while the guitarist Paulo Bellinati says “four guitars are four confusions”. The carrier and the experiences with Quaternaglia are the themes of the statements by the music teacher Ricardo Rizerk, by the musician Fábio Zanon and the guitar teacher Henrique Pinto. The luthier Sergio Abreu comments the details of the handmade instruments that he produces for the group, while the ensemble members reveal details of their musical routine, such as the techniques and accessories they use to tune the guitars. Gravado ao vivo no Teatro Itaú Cultural de São Paulo (Brasil) em 6 de novembro de 2004. Inclui depoimentos de: Egberto Gismonti, Paulo Bellinati, Sérgio Abreu, Ricardo Rizek, Sérgio Molina, Fabio Zanon e Henrique Pinto.